In 1944, the Seagram Company started producing rum under the name Captain Morgan Rum Company. Seagram CEO Samuel Bronfman purchased a distillery named Long Pond from the Jamaican government. Among the buyers of raw rum from the Long Pond distillery was a Kingston pharmacy named Levy Brothers. The Levy family had been purchasing raw rum, adding medicinal herbs and spices, aging, and bottling it. Bronfman liked the rum product and bought the rights to it. In the 1950s the United States federal government & the government of Puerto Rico created a number of economic incentives to create jobs in Puerto Rico. Taxes on rum entering the United States produced in Puerto Rico were less than from other countries outside the United States. At this time both Seagram's and the Bacardi family built large new plants near San Juan. In 1985, Seagrams sold its rum distillery and manufacturing facilities in Camuy and Arecibo -- and doing business as Puerto Rican Destillers -- to Destilería Serralles, a Puerto Rican concern that had been producing the Don Q brand in Puerto Rico since 1865. As part of the contract Seagrams also licensed to Serralles the rights to produce and distribute the "Captain Morgan" brand in Puerto Rico and the rest of the Caribbean until in 2012. In 2001, Seagrams sold the "Captain Morgan" brand to Diageo. Diageo made an announcement on 24 June, 2008 that it intends to build and operate a new rum distillery on St. Croix, Virgin Islands beginning in 2010 and to source from it beginning at the end of their current supply contract in 2012. An actor portraying Captain Morgan at the 2007 Scream Awards. The event was sponsored by Diageo.In 1984, Captain Morgan Original Spiced rum was introduced to the United States. Captain Morgan is, by volume, the second largest brand of spirits in the United States, and the seventh largest worldwide. In 2007[update], 7.6 million 9-liter cases were sold. 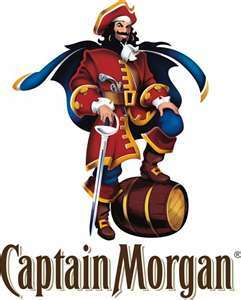 Most Captain Morgan rum is sold in the United States, Canada, Great Britain, South Africa, and Global Travel. Although the pirate Henry Morgan is a figure of Jamaican culture, the Seagram's Captain Morgan Rum is labeled as a product of Puerto Rico, whereas the Captain Morgan Rum produced by J. Wray and Nephew Ltd. is labeled as a "product of Jamaica." In November 2009, the NFL banned a covert ad campaign, allegedly put on by Diageo. It was understood that for each NFL player striking the "Captain Morgan" pose on camera during a regular season game, Diageo would donate $10,000 to the Gridiron Greats (a non-profit which helps retired NFL players with various hardships after leaving the game). The league made this announcement following such a celebration by Brent Celek of the Philadelphia Eagles.